Nissan’s GTR hasn’t always been a 600bhp all-wheel-drive supercar killer. In fact the GTR started life simply as the sporty variant in the humble Skyline range of mid-size sedans. Powered by a 160bhp two-litre inline-6 the original 1970s Skyline GTR was quick enough in its day and it became a successful racing car in Japan and beyond. 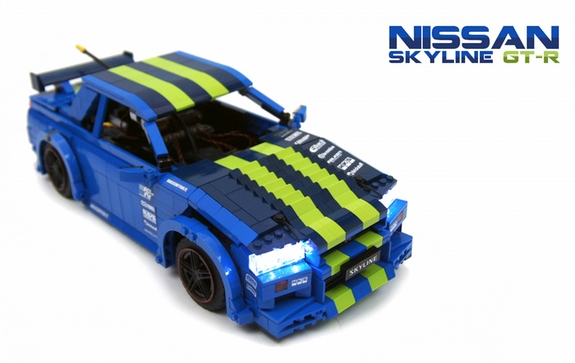 This lovely Speed Champions style creation depicts the second generation Skyline GTR built from 1973, of which just 197 were made before the oil crisis put an end to production and the GTR nameplate was hibernated until 1989. Legomasino is the builder behind it and he’s recreated the 1974 Nissan/Datsun Skyline GTR beautifully. 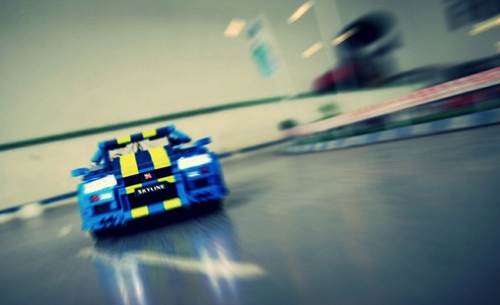 Head over to Flickr via the link above to see more of Legomasino’s superb images. 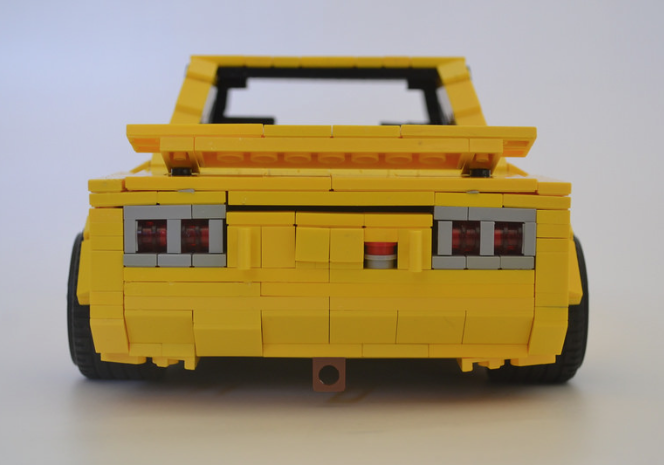 You thought we’d forgotten about the ‘Featured TFOL’ (Teen Fan of Lego) feature didn’t you? Well you’re right. We had. But it’s back! Here at The Lego Car Blog we have quite a strict criteria that must be met before a model is published. However occasionally we bend the rules just a little if a model is close, and if the builder is unlikely to have a billion bricks at their disposal. A Teen Fan of Lego for example. Today’s featured builder is Marco. qm, who has been building cars for a little while. He’s also entered the recent Review My Set competition and suggested models himself via the Feedback and Submission Suggestions page. All of that is very nice, but it doesn’t earn a spot here. However, this does; his excellent Nissan Skyline GT-R R34. Instantly recognisable, with opening doors, hood and trunk, and some interior and engine bay detailing too, it’s a model that’s worth a closer look. You can see more at Marco’s Flickr photostream, and you can discover all of our past Featured TFOL’s by clicking here. Nissan’s Skyline is not made for drifting. With computer controlled all-wheel-drive the GTR is in fact designed to have as much grip as possible. But with enough modifications and some clever engineering Nissan’s technological marvel can be turned into a tool for any purpose, drifting included, and car building legend Sariel has taken exactly this approach to create his drift Skyline GTR. There’s no all-wheel-drive here, and Sariel has fitted his rear-wheel-drive remote control model with a few modifications of his own. Third-party LED lights are employed front and rear, whilst the wheels have been replaced by 3D-printed parts from Seven Studs which provide limited grip on shiny surfaces, allowing the car to get wonderfully sideways. There’s lots more to see, including a great video of the Skyline getting its drift on, at Sariel’s MOCpage – click the link above to get sideways, or here to read Sariel’s interview here at TLCB. Nissan’s current GT-R (previously called the ‘Skyline’) is a seriously impressive supercar killer. But we don’t particularly desire it. We’d like to have a go, sure – but to own… it’s just a bit… dull. Not so the original Skyline 2000, which we want so much that it hurts. Even more so if it’s like this one. Davanchi M has retro-fitted his gorgeous retro Skyline with an RB26DET twin-turbo straight-six engine from a late ’90s Skyline GT-R, meaning it would go as good as it looks. Which is to say, very well indeed. 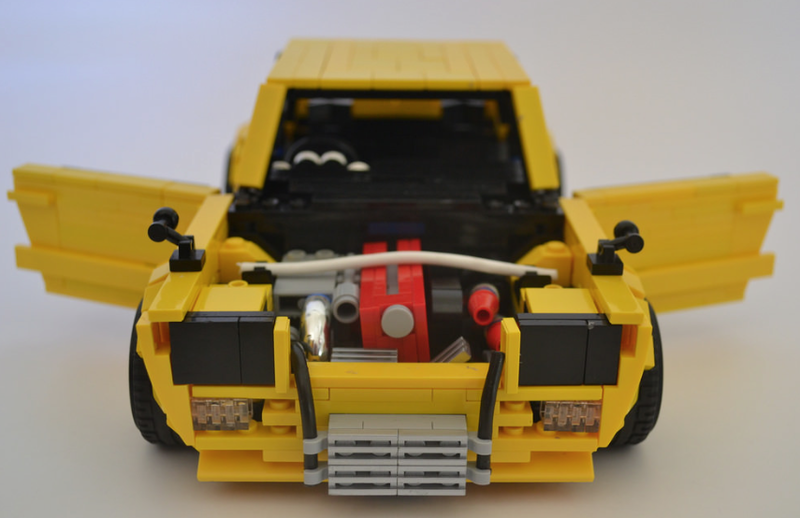 Davanchi has uploaded a full gallery of images to both MOCpages and Flickr – click the links to spool up your turbos. We haven’t watched the new Godzilla movie, due to an unfortunate incident with the Elves at our local cinema prohibiting our patronage, but this vehicular version makes us a feel a bit better. Nissan’s R34 Skyline is getting on a bit now, but the passage of time hasn’t diminished the Godzilla legend. Senator Chinchilla helps to keep the story going with this instantly recognisable Model Team recreation. See more at the link. Probably the most lusted after car of the Playstation Generation, Nissan’s R34 Skyline became one of the most fearsome giant slayers ever built. And – being Japanese – it’s tuneable to produce truly epic power figures. Yakov Selutin makes his second appearance on TLCB this month with his spectacular Model Team recreation of the incredible ’90s legend. See all the photos, including close-ups of the superb engine and interior, at Yakov’s MOCpage here.